FUKUOKA - Hawks closer Yuito Mori was accompanying his two baby children on the way to the parking lot after the team’s 5-4 extra-inning win in Game 5 of the Japan Series at Yafuoku Dome on Thursday night. He was certainly a proud dad. Popular star Yuki Yanagita ended the contest in the 10th inning with his walk-off solo homer. 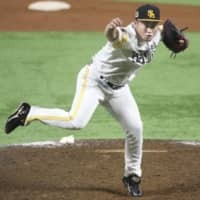 But leading up to that moment, Mori had been given the tough task of shutting down the fierce Hiroshima Carp offense, which he successfully did. In fact, it was a little more than a difficult job for Mori. 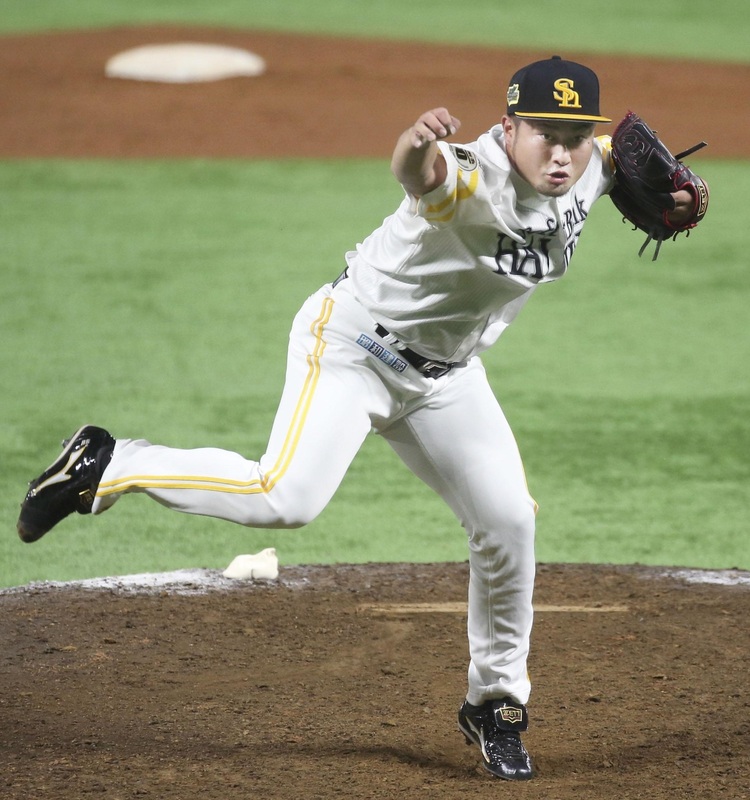 The 26-year-old right-hander has been a closer for the Kyushu club all year, but manager Kimiyasu Kudo sent him to the mound with two outs in the eighth to face catcher Tsubasa Aizawa, who had homered in his previous at-bat, with the game tied 4-4. Mori, who pitched in the ninth as well, ended up allowing no runs. Kudo told his bullpen pitchers and pitching coaches before the game that he might not hesitate to use his relievers at an earlier time than usual if he thought the team would have a strong chance to win the game. So Mori was absolutely ready to take the mound in that situation. The fifth-year pro could have been the losing pitcher if he had given up one hit in the ninth. He had a runner on second but got reigning Central League MVP Yoshihiro Maru to fly out to right on a two-seamer to end the scoring threat. Through Game 5, Mori has pitched in four contests and has not allowed any runs in the series. He has earned a pair of saves for the Hawks, who are one win shy of repeating as Japan Series champions. The Hawks also have Dennis Sarfate, who collected an NPB record 54 saves and was awarded the Pacific League MVP in the 2017 season. But he underwent surgery to repair his right hip in April and missed most of the season. Mori replaced the American as their regular closer. Mori has filled in more than adequately. He racked up a Pacific League-high 37 saves in the regular season. Previously, the Tokushima Prefecture native had been a middle reliever while Sarfate was the team’s fireman. But that previous experience might have helped him enter the game in the eighth on Thursday. And having been the Hawks closer nearly all year and coming through in a pressure-filled situation in Game 5, Mori developed toughness to pitch in those pulse-rising situations in the final innings.